If there’s anyone who deserves a holiday, it’s you. But there’s no need to chew through your annual leave and jet off to the other side of the world for a much-needed va-cay. Nope, the ultimate short break is just a short plane ride away. We are—of course—talking about the incredible city that is Auckland. 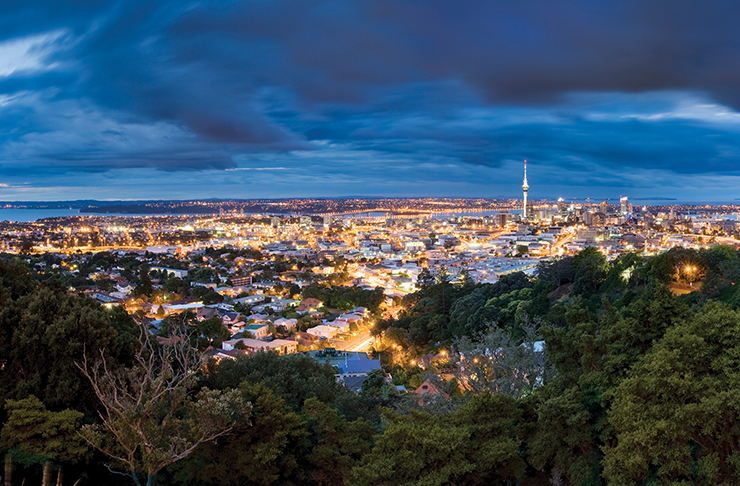 New Zealand’s largest city offers the best of both worlds: urban hustle and nature experiences. You can go from strolling black sand beaches in the morn to a vineyard tour at lunch. And, come sundown, you can find yourself devouring cuisine from all four corners of the globe. Yep, Auckland is one versatile holiday hub. To top it all off, Auckland is also insanely beautiful—a word not usually associated with bustling cities. Curious to find out more, we teamed up with Auckland Tourism to check out the awesome city for ourselves. Here’s what we stumbled upon. Let’s be honest, any getaway must involve divine eats and drinks. And, luckily for your belly, Auckland has one insanely vibrant food scene. From modern New Zealand dishes to an abundance of international cuisine, Auckland does it ALL. Overlook the glistening Waitemata Harbour from one of the many restaurants lining Wynyard Quarter or The Viaduct. For urban, inner-city vibes, check out the eclectic restaurants in the Britomart and Federal Street. If you’re after a caffeine fix, the trendy suburbs of Ponsonby and Takapuna are home to some of the city’s best cafes. Just when you thought the foodie scene couldn’t get any better, Auckland takes things to a whole new level with an entire island dedicated to wine. A dream come right, right? Just a 40-minute ferry ride from the CBD, Waiheke Island boasts more than 30 wineries and vineyards. Our advice? Dedicate a day (or two) to exploring the picturesque island. You’ve got a fair few wine tastings and vineyard lunches to get through! But wait, there’s more. Back on the mainland, there are two extra wine regions to explore. North of the city, Matakana’s wine trail takes you through idyllic countryside. In West Auckland, Kumeu is Auckland’s oldest wine-growing region with both well-known labels and small family-run vineyards. From exotic islands and wild black sand beaches, to 50 (yes, 50!) 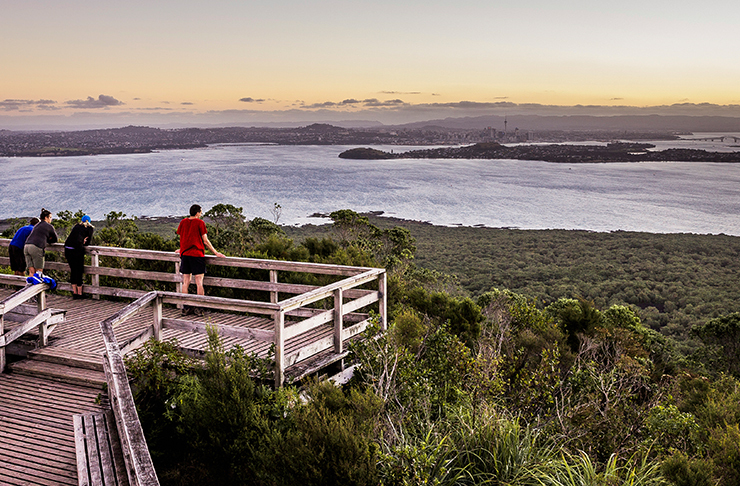 volcanoes and breath-taking waterfalls, Auckland is a nature wonderland. You’re never far from the sea in Auckland. In the north, you’ll discover golden sands and crystal clear waters. To the west, you’ll find remote black sand beaches with rugged coastlines and impressive surf. Surrounded by water, Auckland is dotted with countless islands. Not only does Waiheke boast some of the world's most stunning vineyards, but you can also visit countless olive groves, discover its secret beaches and get your culture on at the local galleries, while Great Barrier Island's dark sky sanctuary status means it’s the perfect place for star-gazing enthusiasts. No visit to Auckland is complete without conquering Rangitoto Island’s volcanic crater, offering an incredible 360-degree view of the city and gulf. Calling all adventure seekers! Go canyoning down waterfalls, zip-line above the trees on Waiheke Island, or clear kayak in crystal waters at Goat Island. Don’t miss the summit views from Rangitoto Island at sunset or a day out on Great Barrier Island (which has some of the best surf spots and white sand beaches around the Medlands, no less). In summer, you’ll find us camping on the ocean side. You’re welcome! Thanks to more than 200 ethnic communities calling Auckland home, the city has one heck of a vibrant art scene. You’ll find yourself captivated on the edge of your seat as you check out theatre, comedy and live music at one of the city’s countless venues. Dedicate time to wandering the ever changing cultural exhibitions at Auckland Museum. And, if you like your art with a side of beautiful scenery, Auckland is the city for you! Head north to check out Brick Bay Sculpture Trail and the newly opened Sculptureum—it has three gardens, six galleries and a vineyard! Feeling inspired? Put Auckland at the top of your travel hit-list and book the ultimate short break!